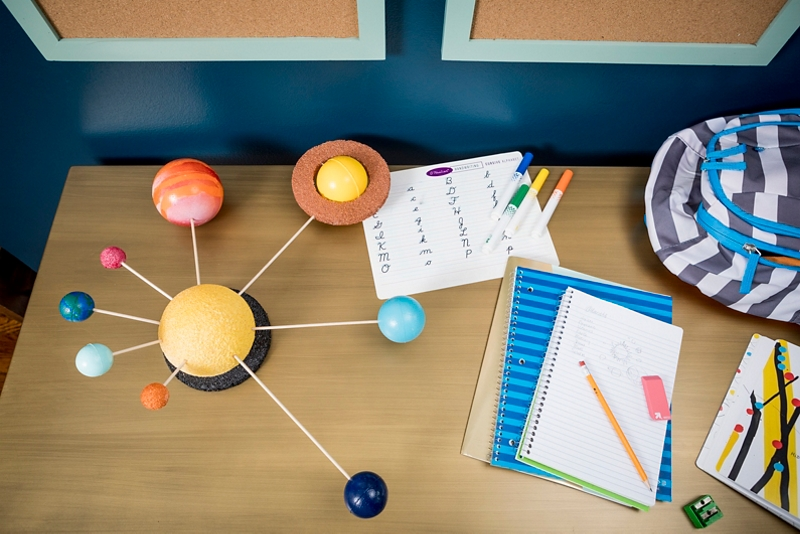 Earn an A+ with a colorful solar system from Krylon®! Always read the label for proper application and safety instructions prior to spray painting. On a covered surface in a well-ventilated area, place the craft foam balls that are 2.5 inches or bigger on the rim of a paper cup to set up for spraying. For the balls that are 2 inches and smaller, turn paper cups upside down, stick a wooden dowel into the center of the cup, and push the smaller balls on the other side of the dowel to keep the balls from moving while spraying. When spraying each ball, place the cups on a Lazy Susan and turn while spraying for ease of application. Spray each ball with Krylon Craft Foam Primer. Once larger balls are dry to touch, flip upside down in the cup to spray the underside of the ball. Allow the balls to cure for 48 hours before topcoating. Lay the two craft foam rings on a flat, covered surface and coat the top side with Krylon Craft Foam Primer. Once the top side is dry to touch, turn the ring over and spray the other side. Allow the rings to cure for 48 hours before topcoating. Once all craft foam supplies have fully cured, topcoat each piece per the chart below, using Krylon ColorMaster Paint + Primer and Krylon Glitter Blast Paint. Use the same spraying technique using the paper cups and Lazy Susan as previously described while top coating. For the planets that require more than one color of paint, such as Earth and Jupiter, use painter’s tape to create continents and stripes. Remove painter’s tape when spray paint is dry to touch to avoid peeling paint. Allow paint to fully dry before assembling the solar system. When ready to assembly, use a ruler to measure the dowels to the appropriate lengths as seen in chart below. Mark measurements with a pencil and then cut the dowel using a handsaw. Stick one end of the dowel into the sun and the other end into the planet. Prior to attaching Saturn to the Sun with a dowel, stick a toothpick on opposite sides of the diameter and then place the ring around the ball and stick the other side of the toothpick into the ring. Turn in your project and receive an A+!